Preheat oven to 300ºF on the convection setting. Mix the butter and graham cracker crumbs together. In an 8 inch spring form cake pan, line bottom with a circle of parchment paper. Put 1/2 cup of the crumb mixture in the pan. Spread the crumbs evenly over the bottom and press down with flat bottomed glass. Bake the crust until slightly golden at edges, about 7-10 minutes. In the bowl of an electric mixer using the paddle attachment, soften the cream cheese. Add the sugar and mix together. Scrape down the sides often and once there are no visible lumps, add the cornstarch. Add the eggs one at a time, scraping in between each addition. Add the mascarpone cheese, mix to combine, then add the crème fraiche to the cream cheese mixture, beating until smooth. Pour into the prepared crust and bake until set. Cheesecake should jiggle in the middle when pulled. Let cool for 1 hour, remove spring form ring and slice. Set a silicone baking mat in a half sheet pan and set aside. In a saucepan over medium heat combine the corn syrup, water and sugar; heat until sugar dissolves. Increase heat to high and boil without stirring until candy thermometer registers 260 °. Be patient. Reduce heat to medium low and mix in butter, stirring constantly and continue to cook until thermometer registers 295 °. Turn off the heat and immediately stir in baking soda and vanilla. Mixture will foam up. Stir in the mushrooms and immediately pour out the brittle on the silicone baking mat as thin as possible. Let stand until cold and hard. Break brittle into pieces. Place a slice of the cheesecake on a plate. Place 2 tablespoons of strawberries next to the cheesecake. Top the cheesecake slice with a few of the candied mushrooms and drizzle a small line on aged balsamic vinegar across the plate. 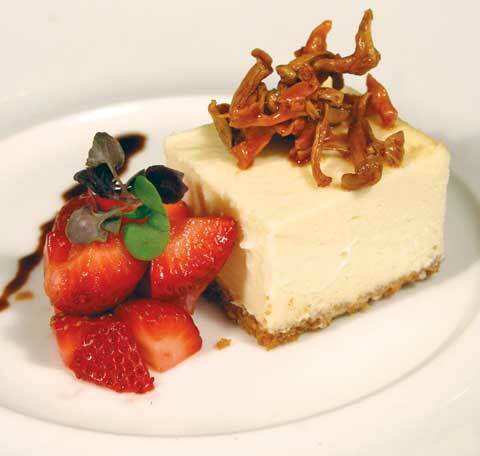 Top strawberries with microgreens.